Panerai have just recently released a gorgeous trio of green dialed watches. Of the three, this seemed the most intriguing proposition, so here it is! 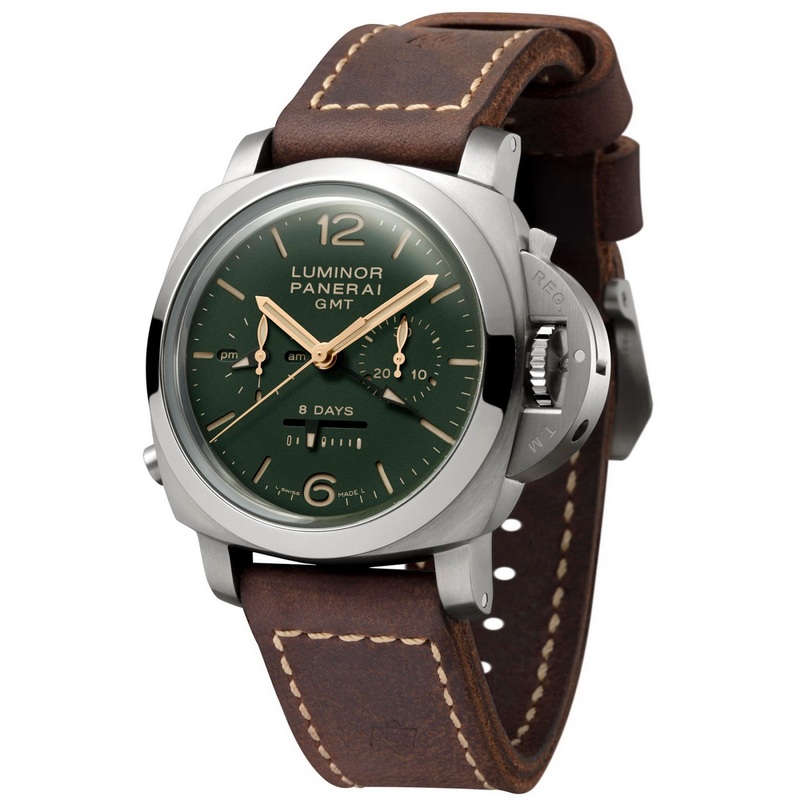 It’s called the Luminor 1950 Chrono Monopulsante 8 Days GMT AKA PAM 00737. 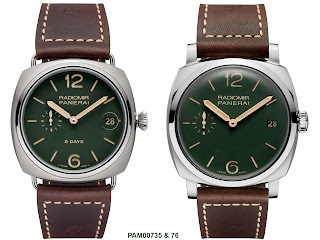 PAM00735 and PAM00736 are Radomir models. 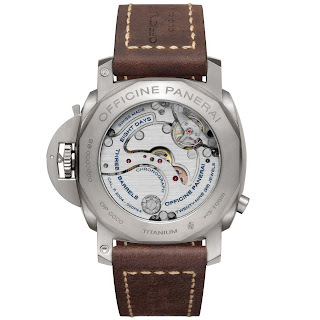 PAM00735, like this model is in Titanium with an 8 Days movement while PAM00736 is in Stainless steel with a 3 Days movement. They can be seen together down the bottom of this post. BTW, did you say ‘Monopulsante’ with an Italian accent? 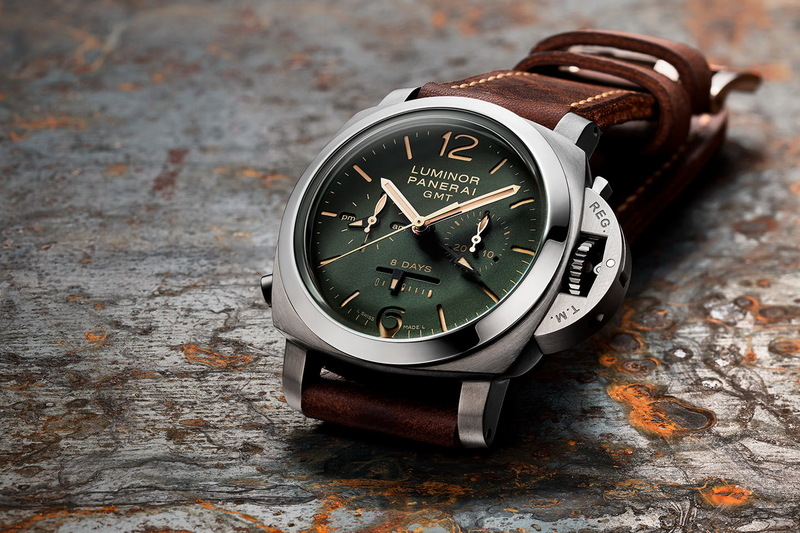 Sounds sexier, right – it basically means mono-pusher as in the single pusher located at 8 o’clock on the case that is used to activate the watch’s chrono-function. 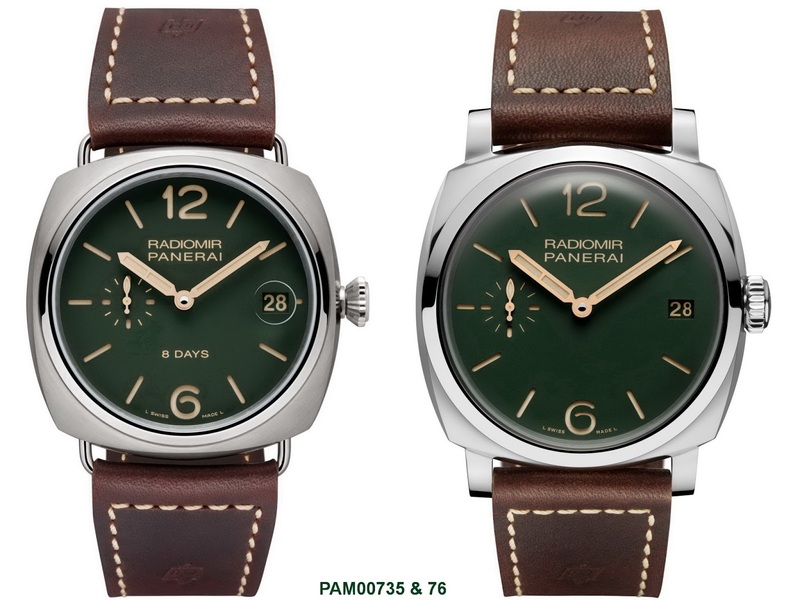 PAM00737 has a brushed Titanium case measuring 44mm in diameter. 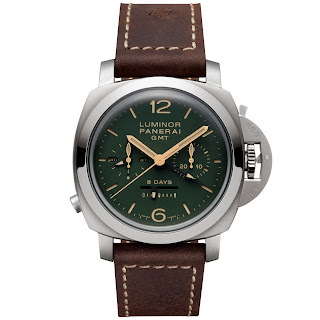 No turning bezel of course but with the classic bridge lever device, patented by Panerai in the 1950s, to protect the winding crown and to help ensure the water-resistant to a depth of 100 meters. The fixed bezel has a polished finish and on the caseband at 8 o’clock is the push-button which controls the start, stop, and reset operations of the chronograph with its many functions and advanced technical features. The dial is in this stunning green (I really wish it was available on a Submersible model). It is easy to read and it clearly displays the indications of the functions of the hand-wound P.2004 caliber with a power reserve of eight days. This is achieved by having three spring barrels in series. 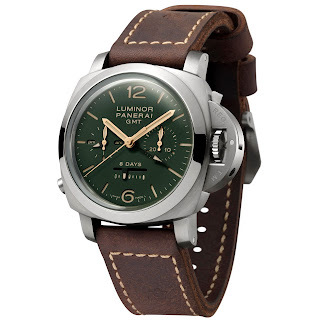 The linear power reserve indicator is at 6 o’clock, while the seconds counter and am/pm indication relating to the central second time zone hand is positioned at 9 o’clock. 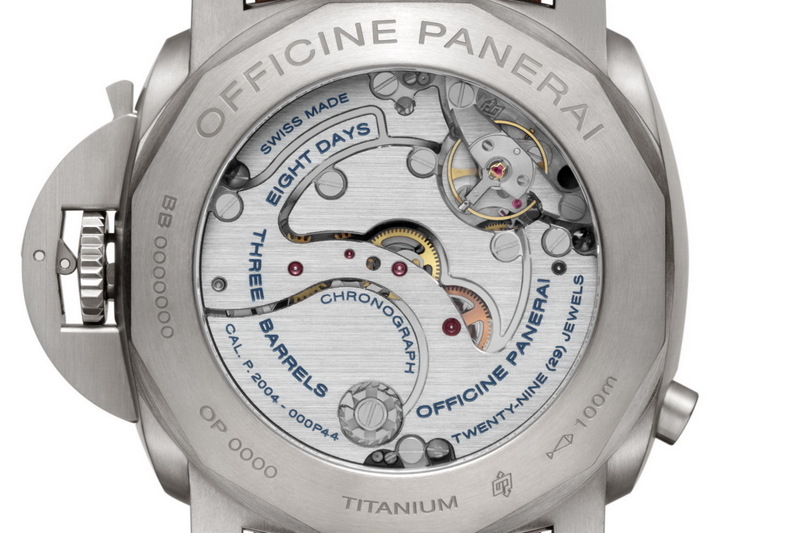 The minutes of the chronograph are measured by the small counter at 3 o’clock and there is a central seconds hand. 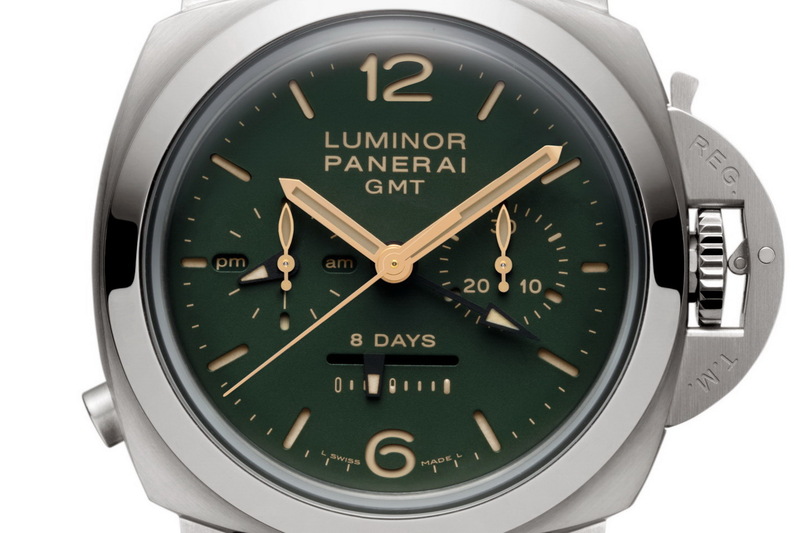 All the hands, apart from the GMT function, are gilded and they coordinate harmoniously with the beige markers on the green sandwich dial. 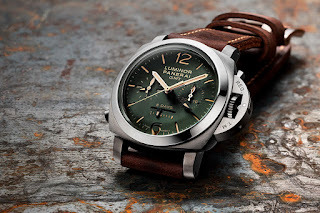 Like the other two models of the Green |Series, the Luminor 1950 Chrono Monopulsante 8 Days GMT Titanio is presented in a beautiful green cherry wood box. Inside the box is a replacement black rubber strap and tool for replacing it plus a screwdriver. Thoughts? I’m literally slobbering all over my keyboard!